For those friends or family members that are full of good humor, we’ve put together our final Handmade Holiday Gift Guide: Gifts that are Just for Fun. From catchy tees to sassy pillows, a scary journal to a witty doormat we think you’re sure to find something in here that’ll make you smile. We’ll also be sharing more of our favorite finds this week on our facebook page here. 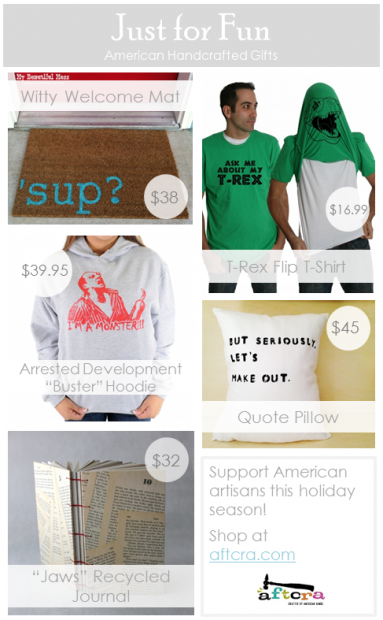 Support American artisans this holiday season – shop handmade at www.aftcra.com!